WHAT: Dedication of the new visitor facilities, services and programs developed as part of the 75th anniversary of the Golden Gate Bridge. The program features a ceremonial ribbon-cutting at the new Bridge Pavilion, renovated Round House, improved Bridge Café and expanded Bridge Plaza, and also highlights the improved trails and new overlooks in the Golden Gate National Parks anchoring the span. The event also serves as the official kickoff to the Golden Gate Festival, the cornerstone public anniversary celebration along the San Francisco waterfront taking place on Sunday, May 27, 2012 from 11:00 am-11:00 pm. Media parking: TV vans must arrive at southeast visitor parking area by 9:00 am. Additional media parking is available on the southwest side of the Bridge near the administration building. Please look for MEDIA PARKING signs and the coned-off zone. WHY: This event is one of many surrounding the Golden Gate Bridge’s 75th Anniversary, a year-long-celebration organized by the Golden Gate Bridge, Highway and Transportation District and the Golden Gate National Parks Conservancy, in cooperation with the National Park Service, Presidio Trust, and the City & County of San Francisco. The Golden Gate Festival on Sunday, May 27, 2012 will feature music, performances, family activities, and a grand fireworks finale at 9:30 pm. The USS Nimitz (CVN68), one of the world's largest naval ships with a crew of more than 3,000 sailors, will make a striking entry to San Francisco Bay sometime during Sunday’s waterfront Festival. The supercarrier's time of arrival in San Francisco is still to be confirmed. Updated public and media information will be posted at www.goldengatebridge75.org. PLEASE NOTE: In recognition of engineer Charles Alton Ellis and his contributions to the design of the Golden Gate Bridge, the American Society of Civil Engineers (ASCE) is installing a plaque in his honor in the renovated Bridge Plaza. A dedication ceremony with ASCE President Andrew Herrmann, historian Paul Giroux and other Bridge District and ASCE leaders will take place at 1:00 pm following the May 25th ribbon-cutting. Please contact Mary Currie at 415.317.2222 for more information, mcurrie@goldengate.org. 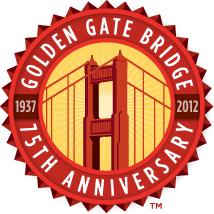 The 75th Anniversary of the Golden Gate Bridge is a project of the Golden Gate Bridge, Highway and Transportation District and the Golden Gate National Parks Conservancy in collaboration with the National Park Service and The Presidio Trust. The year-long celebration and visitor services improvements are funded by private contributions, with major underwriting provided by Wells Fargo, Genentech, HP, and Kaiser Permanente. Anniversary events include The Golden Gate Festival along the San Francisco waterfront on May 27, 2012; 75 Tributes to the Bridge, a year-long series of public programs presented throughout the Bay Area; renovation of the historic Round House and construction of a new visitor Pavilion; and enhancements to the Bridge Plaza and Golden Gate National Recreation Area parklands on both sides of the span. For additional information and all public inquiries, please visit www.goldengatebridge75.org. The National Park Service (NPS) is a federal agency within the U.S. Department of the Interior charged with managing the preservation and public use of America’s most significant natural, scenic, historic, and cultural treasures. The NPS manages the Golden Gate National Parks, as well as 394 other park sites across the U.S. For more information, visit www.nps.gov/goga or call (415) 561-4700.